Apparently I am a sucker for Readathons. I think this is partly because I am still feeling like crap so I am honestly not doing much but reading (and surprisingly enough blogging) because as is obvious from this blog I do not do much of that. 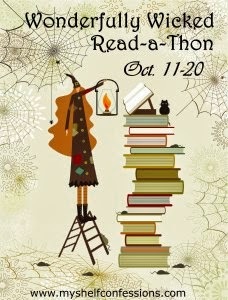 The Wonderfully Wicked Readathon is hosted by My Shelf Confessions and is a week-long readathon. I figure I might as well make good use of the fact that I am reading and keep up the momentum by giving myself motivation to blog about it. Who knows maybe this will become a Real Book Blog and by that I mean one with actual updates! Oh and reviews. So yes I read a lot of books at once. I like to read and eat and sometimes the books I am reading are not suitable for eating and reading. I also need to read The Diviners by Libba Bray for my book club. Plus anything from that pile of books that I did not get to in the 24 Hour Readathon. I hope that the reading is going well. I sign up for the readathons to keep me reading.